(Nanowerk News) A new paper by Okinawa Institute of Science and Technology (OIST)’s Neural Computation Unit has demonstrated the usefulness of robots in studying evolution. Published in PLOS ONE ("Emergence of Polymorphic Mating Strategies in Robot Colonies"), Stefan Elfwing, a researcher in Professor Kenji Doya’s Unit, has successfully used a colony of rodent-like robots to watch different mating strategies evolve. The work not only generated interesting and unexpected results, but it has also helped validate the use of robots in the study of evolution. Males and females of different species have different strategies of attracting and selecting mating partners. Evolutionary theory suggests that only one distinct phenotype, in this case referring to mating strategy, should exist within a population. This is because natural selection dictates only the best strategy will survive. However, in nature, we see polymorphic mating strategies, meaning there are multiple ways of mating within one population. How these different mating strategies evolved is debated among evolutionary biologists. Studying the evolution of such behaviors in living populations of complex animals is exceedingly difficult. By using robots and computer simulation, Dr. Elfwing is able to watch evolution happen over 1,000 generations in a short period of time, something that is impossible to do in live animals. This is why some scientists have turned to robots to study evolution and see if they can understand how different behavioral strategies develop within a population. Dr. Elfwing programmed a small colony of Cyber Rodent robots, which have two wheels, a camera to detect batteries and other robots, electrode teeth to recharge from batteries, and an infrared port for ‘mating,’ which is to copy their ‘genes,’or the essential parameters of the program. 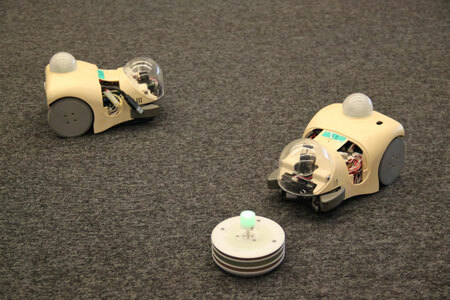 The robots could execute two basic behaviors: foraging for a battery and searching for a partner to mate. The experiments were run in computer simulation to observe the evolutionary process over 1,000 generations in each experiment. In the situation when both a battery and the tail of another robot are visible, two main phenotypes in mating strategies emerged: first, a Forager that only went for the battery and would never wait for the partner to turn around for mating. It would only mate when it saw the face of a potential mate. Second, a Tracker that would wait for the mating partner to turn around for mating. The interesting result to come out of some of the 70 experiments was a polymorphic population where these two different mating strategies, or phenotypes, co-existed within one population. By running experiments with different ratios of the phenotypes, he further showed that there was a stable mixture ratio of 25% Foragers and 75% Trackers. The evolution of two distinct mating strategies is similar to what is seen in the wild. In some experiments, only one strategy would evolve in the population. However, in the experiments where polymorphic populations evolved, the robots had some of the highest fitness, or fastest reproduction, out of all of the experiments. This indicates that the presence of these different mating strategies in certain proportions provided the best chance for proliferation. Understanding the complex processes of evolution, and having a better way to study them, may be closer than ever, thanks in part to Dr. Elfwing and the Doya Unit’s interest in robots.